Staying focused as we approach the finishing line. Supporting our MA students in Bangalore as they work on the preparation of their dissertations is always interesting and at times challenging. At present we are working with a very enthusiastic and able group who have generated excellent research proposals and piloted one of their data collection instruments. At this stage of their progress they come back to us with many questions and a few anxieties about aspects of their piloting that maybe didn’t run as smoothly as might have been wished for. At the moment our job is not simply to give answers, but to give them opportunities to find solutions. As part of the proceedings we encourage these neophyte researchers to bring their issues to sessions in order that we can help them to think these through, and learn about managing their projects. This invariably leads to lively debates and results in a stimulating learning environment from which we all benefit. Today was no exception. This afternoon started with one of our students showing a brief clip of video recording of her work with parents of children from a village community near where she is based. Many of these adults are parents of first generation learners and our student wishes to gain data from them to inform her research, which is examining the effectiveness of the school provision made for their children. This is an exciting project which demonstrates the commitment and impact that some of our students are having in fostering more inclusive learning opportunities. In order to gain the data that she requires this keen researcher is planning to use focus groups, but like many at this stage of her research development, she is apprehensive and has questions about how best this should be managed. What are the difficulties in collecting data from parents who cannot read and write? How do I manage a group when they don’t follow the conventions of taking turns to speak? These and other similar concerns were brought to the table. So this afternoon, much of the time was spent in role play, with students taking the part of participants, researchers, recorders and observers. 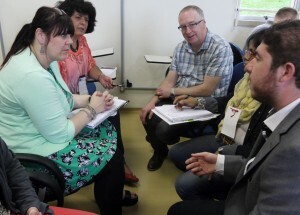 Everyone took the role they were playing seriously, and the action was followed by a lively discussion, with an exchange of ideas and suggestions that helped in the development of a set of principles for focus group management. Hopefully our student feels more confident and many of her questions will have been addressed. I look forward to her reprting back after the next stage of data collection. 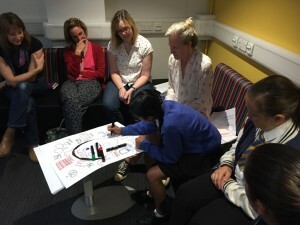 Sessions such as these, led largely by the students themselves, and often involving friendly banter and laughter, can only be conducted when they feel at ease with each other, respecting their classmates and demonstrating a willingness to share ideas. I am sure that as these students begin the last leg of their journey towards achieving their MA degrees they are forming friendships that will endure, and have gained new skills and knowledge that they will take forward for the benefit of the children and teachers with whom they work. Days like today reinforce the fact that it is a privilege to work together with such committed professionals. Good news about teachers just doesn’t sell newspapers! Sometimes it feels like the opinions of teachers count for very little when judgements are being made about the quality of education provided for children. It is often the case that when children are perceived to be under performing in schools, or there are media reports about discipline issues, fingers are quickly pointed at teachers as the sole cause of the problems reported. Here in England there was a time when the views of teachers were eagerly sought by education policy makers at local and national levels. Politicians and administrators were keen to obtain the opinions of those who were working in classrooms in order to inform their ideas, influence policies and bring about change. Sadly, in recent years this has become a less common approach, with a great deal of educational policy made by politicians without recourse to the opinions of teachers, who are often then seen to be held responsible when things don’t quite work out as intended. “aims to move beyond cliché and misrepresentation, bringing to the fore teachers’ own perceptions regarding the education universe they inhabit”. Perhaps at last, I thought, we have a report that will respect the views of those who work most closely in classrooms, and can provide insights into their professional lives, with all of the concomitant successes and challenges that typify every day school life. Indeed, within a very short time of commencing my read I found that the experiences of the 823 teachers and 441 head teachers interviewed for this research were being presented and discussed in a manner that was respectful, empathetic and realistic in interpretation. There was little evidence of rose tinted glasses in the report’s presentation of facts and figures, but neither was there an apportioning of blame where specific difficulties were identified and shortcomings discussed. Overall the document presents an honest appraisal of school life, drawing upon the perspectives of experienced school professionals alongside a review of significant facts and figures. On reaching the final pages of the report I found myself wondering, why more reports should not draw upon this rich seam of data, provided by teachers and presented in a well-balanced and lucid manner. If only I could find such a document within my own country! Ah yes, you see, the report in question adopts an approach seldom seen in today’s English education system and comes in fact from Pakistan. The research that informed this report provided data from both questionnaires and interviews, and identified examples of both good practice and shortcomings in classrooms. Among the issues which were identified as problematic in Pakistan’s schools, were overcrowded classrooms, poor quality textbooks, a lack of facilities and equipment, and inadequate professional development opportunities for teachers. The report does not overlook the impact of poverty, stating quite clearly that there are many children attending schools who are malnourished and therefore lack the energy to learn effectively. Despite the many challenges faced by teachers, the authors of the report described them as being willing to learn and improve their performance, and certainly not lacking in motivation. Many express the opinion that they gain great satisfaction from enabling their students to learn. “If there is one clear message from our study, it is that responsibility for the failure to deliver high-quality education does not lie at the doorstep of teachers alone. In fact many of the challenges that teachers face daily have as much to do with their own capacities as with policies and procedures far removed from ground realities and in dire need of an overhaul. 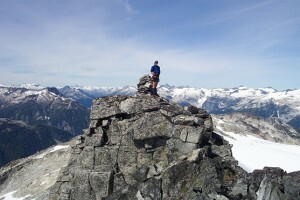 It is up to provincial governments to take on this challenge”. This was indeed a finding from the research, and I should not have been surprised that it was singled out for attention by the media. 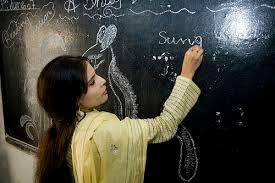 I too was appalled that corporal punishment continues to be seen as a legitimate means of maintaining order in Pakistan’s schools, but just for once it would have been good to see a report that emphasised some of the more positive characteristics of teachers working for the benefits of children, often under the demanding of circumstances. Reporting fairly on the findings of this research could well have provided a much needed boost to teacher confidence – but then, good news rarely makes for attention grabbing headlines! Having received this response I am not sure that her friend was totally convinced that this would justify the many hours of hard work and occasional anxiety that characterises the research degree experience of most students. However, I am sure that this neophyte researcher is commencing her journey with exactly the right spirit and attitude to enable her to succeed. Progression to study for a research degree is certainly not the best path for everyone, and those who enter such a course of action need to be fully aware of the personal sacrifices, doubts and apprehensions that will most certainly lie ahead. However, for those who complete the path there will undoubtedly be feelings of accomplishment, satisfaction and hopefully a renewed sense of commitment to their subject and the opportunity to make a difference. It is therefore always a pleasure to be amongst enthusiastic students about to launch forth into their doctoral studies and to share with them in discussions about their interests and passions. On Friday afternoon I spent a little time with around forty such keen individuals each of whom was coming to the end of their induction period and were now about to cast off from the harbour upon their academic adventure. Some will conduct their studies in areas associated with education, and I hope to get to know these students well over the next few years, others working in the sciences, arts, business, history or technology are less likely to come into my immediate purview, but it was a pleasure to be amidst their enthusiastic banter as they discussed their areas of interest with enthusiasm and authority. Such occasions invariably bring questions to the forefront about why students give such a commitment and make personal sacrifices for learning. Their motives may be many, but it is clear that somewhere along the line they have been inspired to learn, imbued with a spirit of curiosity and encouraged to think critically and develop their own opinions and ideas. I like to think that they have, in part at least, come to this position with the aid of teachers who have committed themselves to their students, whilst demanding excellence and encouraging an enthusiasm for investigation and learning. I am quite sure that if those teachers who had thus inspired these new doctoral researchers in this way had been in that room alongside their former students on Friday, they would have been assured that they had done well by their charges. Throughout this week three students who recently studied for the MA in Special and Inclusive Education which is managed by the University of Northampton in Bangalore have been here in England. Having proven to be outstanding students on the MA programme they have now advanced to enrol as research students working at PhD level. This is a moment of considerable pride for them, for their families and also for the university. 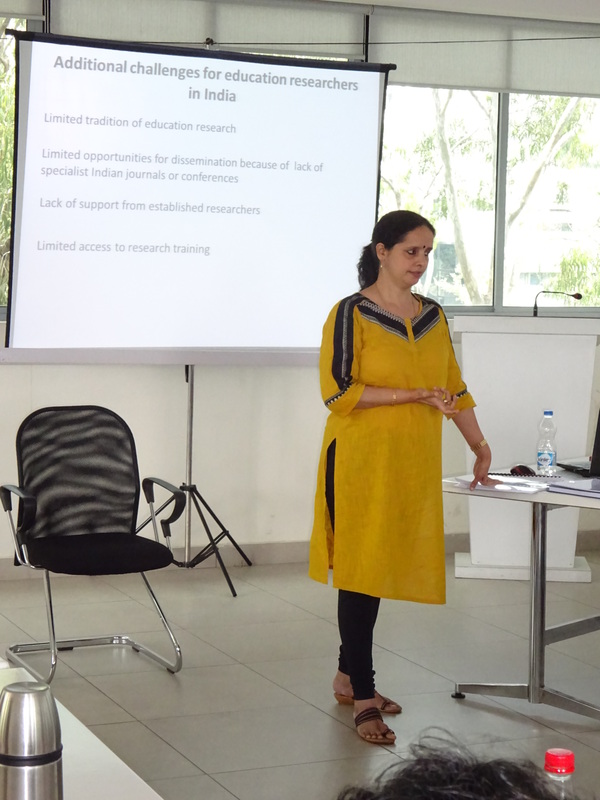 A common concern expressed by students studying on the Bangalore based programme, is that there is a limited corpus of research literature related to special and inclusive education in an Indian context. Students inevitably find themselves referring to journal articles, books and research reports from outside of India which presents the added challenge of having to critique this work in relation to an Indian education system. It should be obvious that some of the approaches to teaching and learning adopted, for example in the more affluent areas of Europe or the USA, will not be easily applied in rural Indian schools. Issues of resourcing, training, expectations, attitude and understanding all need to be interrogated before any confidence can be gained in the application of ideas from socio-economically advantages countries. It is therefore critical that the research capacity in this area in India is increased, and that more Indian researchers make a contribution to the research literature. Data in relation to inclusion and exclusion is at a premium at present, and it is essential that local researchers address this shortfall in order that teachers, parents and children can move towards a more just education system with confidence. 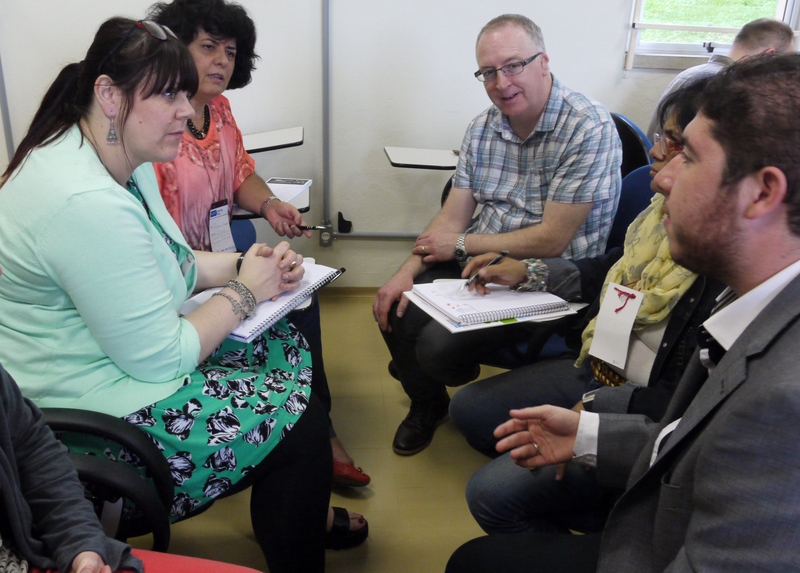 The three colleagues who have joined the PhD programme here in Northampton this week have already begun to address some of the limitations in research in special and inclusive education in their country. Two have recently published papers in peer reviewed journals based upon their MA dissertations, and all are developing proposals to address critical areas related to the teaching of previously marginalised children in their communities. Their research will of necessity require them to engage with teachers, parents, children and policy makers in India, thereby broadening understanding of the complex issues that they are proposing to address. 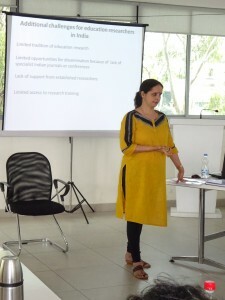 As all teachers in India are confronted with the challenges of meeting the requirements of the Right to Free and Compulsory Education Act introduced in 2009, they are increasingly seeking the support of colleagues who have begun to consider how first generation learners, or those from scheduled tribes or scheduled castes, along with others with disabilities and special educational needs can be included in Indian classrooms. I am sure that in this regard our students in Bangalore will make a significant contribution to the support of their colleagues, and these new and enthusiastic researchers will provide data with which they can inform change. Meeting with these three new research students this morning they described the journey upon which they are embarking as “exciting”, “scary”, “daunting”, and “challenging”. I am quite sure that all of these words are apt, but also convinced that in the near future they will be making a significant contribution to a growing body of research literature in India. We are fortunate in having these students here with us for a few weeks in Northampton and I am sure we are going to enjoy working alongside them in India over the coming years as they progress towards their doctorates. I look forward to reporting their progress over the years ahead. We are always delighted when our students return to share their experience with current cohorts. When they share their learning with a wider audience we are thrilled! Devising research questions is not as easy a task as it may sound. 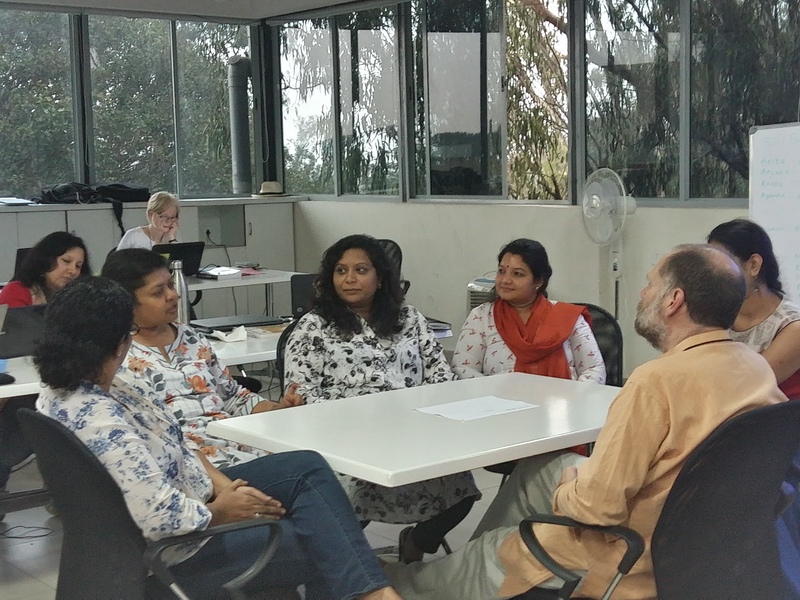 Yesterday on the MA programme here in Bangalore a group of enthusiastic students set about the task of identifying topics and research questions that will inform their dissertations. The dissertation is a major piece of work on the course, and for most it represents the largest volume of writing they have ever had to complete. You may then understand why there is always a little apprehension at this stage of the course. Such mild anxieties, whilst understandable, will soon be overcome by this group of students who have remained focused and worked hard throughout the course, and have shown themselves more than equal to every task they have approached. I am confident that by the end of this week they will all have identified a clear set of questions that will inform their small-scale projects and lead to some interesting research. One of the major challenges for students working on this course is the limited range of research literature available to them that has been conducted within an Indian context. Often they find themselves referring to European, Australasian or American literature and having to consider its appropriateness in terms of the socio-economic and cultural conditions that are found here in India. This is a challenge that they approach thoughtfully as reflected in much of their writing. From the beginning, when we started the course with our first cohort we emphasised to our students that they had an opportunity to contribute significantly to the Indian literature in the field of special and inclusive education. I think at first they believed that papers in academic journals and chapters in books were written only by those working in universities with many years of experience. We have encouraged them to understand that there is in fact a huge gap in the literature related to the application of teaching and learning approaches for children from marginalised groups, including those with special educational needs and disabilities in India. We recognise that not all of our students in Bangalore will want to embark upon a path of writing papers, submitting these to the rigour of the journal peer review process, with the inevitable possibility of rejection, and finding the time necessary for amendments and rewriting. But we have been greatly heartened by the response to our suggestion that they can indeed make an important contribution to the literature. Over the next month, several of our students from our first cohort and one from the third will see their work in print in two different peer reviewed journals – Support for Learning, and Good Autism Practice. We are, or course, immensely proud of their achievements and this concrete evidence of their expertise and hard work. I am confident that many of our students will play a leading role in the promotion of inclusive practice here in India, and optimistic that we will see more of their research and writing in print in the near future. Whilst the MA course here in Bangalore does not set out with an expectation that all students will become published researchers and authors in the field, it is good to think that others embarking on this journey will be able to refer to the literature generated by those who went before them. It may seem to many that their contribution to research and the literature is small, but every journey begins with a single step and these excellent students have in fact taken a giant stride. Teaching old dogs new tricks! 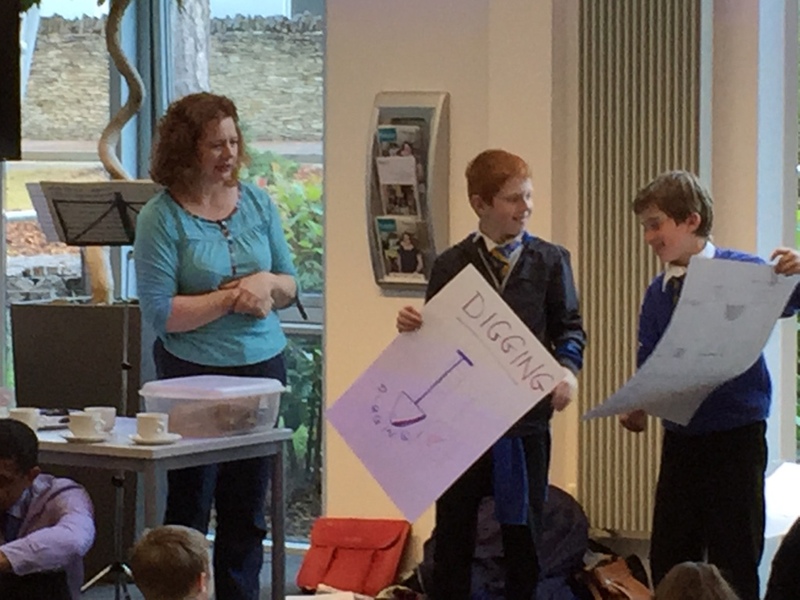 Young teachers at work – and note how their older students are enjoying this! Training and encouraging researchers in education is often a difficult task. There are as many ways of conducting and interpreting research as there are researchers. Approaches to training therefore need to offer ideas in a manner that is both flexible and challenging. So yesterday, having been asked to present ideas about moving the educational research agenda forward here at the university, my colleague Philip decided we needed to pursue new avenues. The easy option would have been to use an “expert” researcher to deliver a training session focused upon some form of innovative data collection approach or theoretical framework, or to introduce the latest piece of software designed for analysis or interpretation. However, this is an approach that would surely alienate some colleagues and be declared “old hat” by others. Thus it was decided that we should adopt a strategy that would hopefully surprise and unite even the most hard bitten researchers. 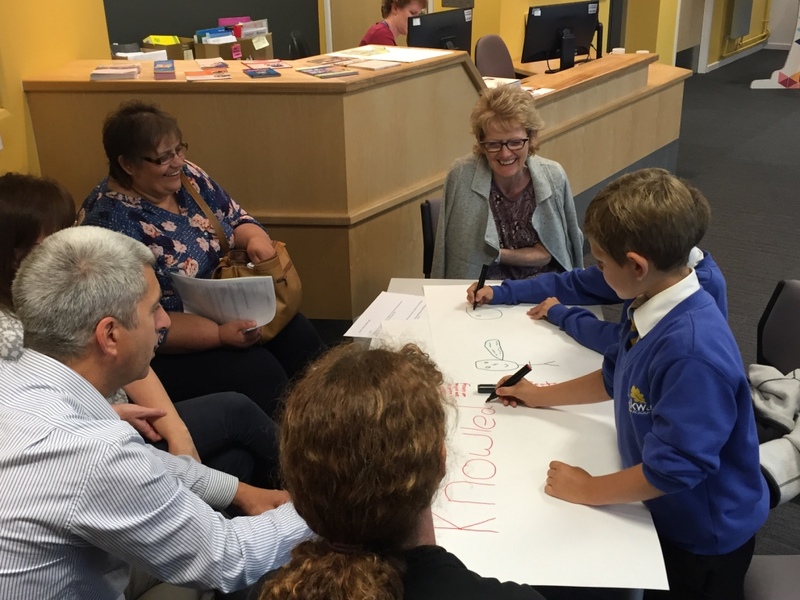 Had you visited the School of Education at the University of Northampton yesterday morning you would undoubtedly have noticed the enthusiastic children who were engaged in activities around the building. School pupils in their bright blue uniforms were sitting at tables, and others on the floor, working with academic colleagues on a range of tasks. Producing posters, designing slogans and logos and generally participating in discussion and debate, these enthusiastic individuals worked hard all morning to educate the adults around them. 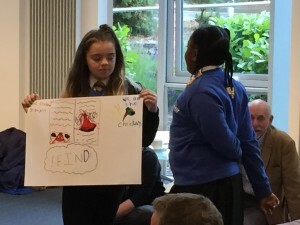 Their task – to tell the adults in their groups what research means to them, and to inform us about why they believe that investigation is an important element of learning. As the morning progressed they identified key words that reminded us of why we began our journey as teachers and researchers. Curiosity, finding things out, discovery, digging for information, exploring new ideas – these were just a few of the expressions that emerged from their work. 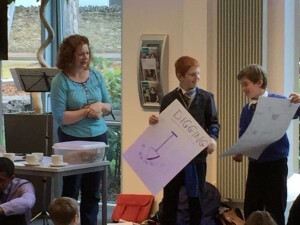 At the end of the morning they presented their drawings and key words to the gathered audience. They did so with confidence and authority and with good humour and logic. They explained their reasoning and taught us much about the importance of investigation, and the value that we should be seeking to provide in our work as teachers and researchers. At the end of the day everyone who had attended today’s training sessions had a broad smile. 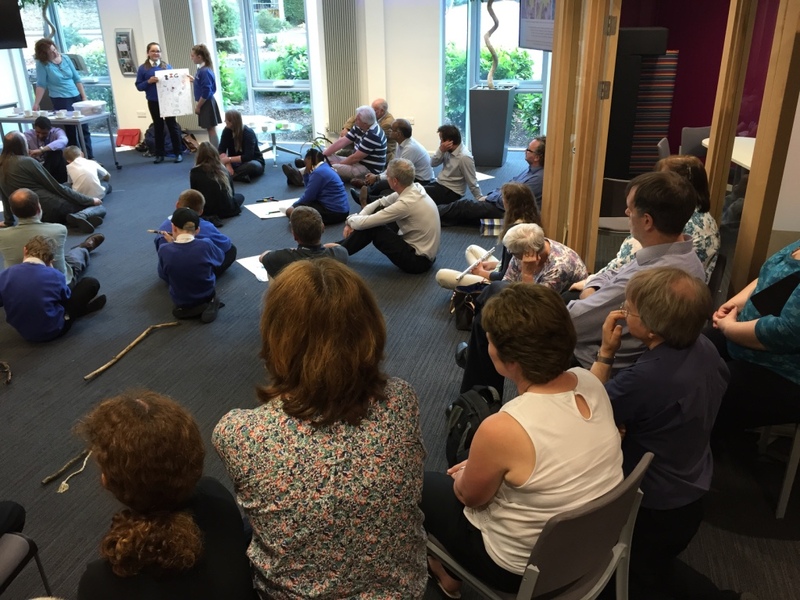 There was a general acknowledgement that a group of eight and nine year old children had made us think about research in ways that the acknowledged “experts” could never have achieved. I am sure that my memories of the day will largely dwell upon the enthusiasm with which children were able to address issues which we may well have over-elaborated, and made difficult through our dubious levels of sophistication. In my experience listening to children usually helps us to see the world in ways that we might have forgotten. The wisdom emanating from a group of school pupils today may hopefully have assisted us in developing as better teachers and researchers in the days to come. The opportunity we had to learn from these children is far more profound than anything I have to say – so I hope you just enjoy today’s pictures. With many thanks for permission given to use these by the children and staff of Oakway School. An attentive class, sitting up and paying attention! 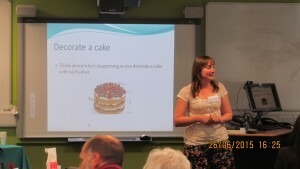 Decorating cakes has a place in educational research – thanks Jessica! For many young researchers working towards a PhD, presenting their work to an audience can seem like a daunting experience. When English is not your first language, and may indeed be your third or fourth, I’m sure that this experience can appear even more challenging. It was therefore with a feeling of great respect and admiration that I listened today to a number of presentations given by students at the annual education research student conference at the university. This important event in the research student calendar provides an opportunity for them to share their work in progress, gain comments from their peers and from more established researchers and to test their ideas in front of a sympathetic audience. 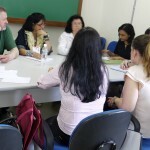 In addition it provides PhD supervisors with a unique opportunity to gain a broader perspective of the educational research being conducted, often in areas that are outside of their usual field of vision. This was exactly the situation yesterday as students from the UK, Vietnam, Nigeria, China and Ghana provided insights into their work on a varied range of subjects. These ranged from gender issues related to approaches to mathematical calculations in primary school children, through the development of national funding policies for higher education in Vietnam and the coping strategies of academics working under stress in universities. It is not only the range of topics that make this conference so interesting, but also the approach to presentation. Whilst some opt for a traditional and quite formal presentation of a paper, others adopt a more innovative approach. Phil’s performance of his research findings put across some serious messages whilst entertaining his audience and raising laughter. Jessica, describing her work around peer mentoring for children with profound and multiple learning difficulties had everyone decorating cakes as a means of demonstrating part of her methodology. A particular innovation for this year’s conference has been the live streaming of sessions to make them accessible to our students and others who were unable to attend. It was particularly heartening last night to discover that colleagues in India, China and Germany, as well as other parts of the UK had made use of this new opportunity. Today the conference continues and we can look forward to more interesting papers from the UK, India, China and Nigeria, and witnessing a developing confidence in our research students. This conference, entirely organised by research students provides ample evidence that the future of educational enquiry I safe in their hands. Thank you to all who contributed so much to this excellent event. You can switch in live today’s sessions by clicking on the link below from 9.45 am UK time. 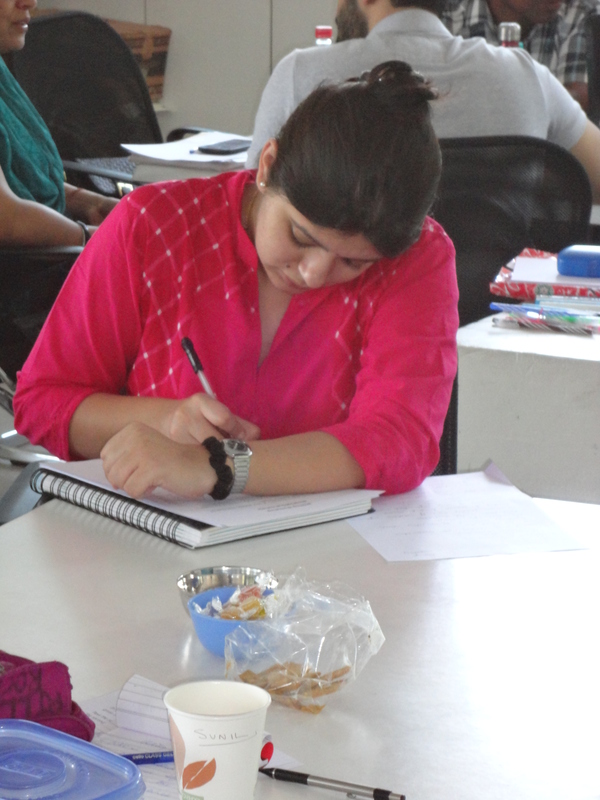 The quality of our students in Bangalore is such that we look forward to their continued study with us. I am sure that tutors the world over who teach on post graduate degree courses would agree, that from fairly early on in the teaching process, some students stand out as potential candidates to study at doctoral level. Having taught on master’s level degree courses over a number of years, I can recall many occasions when I have had conversations with individuals regarding the possibility that they might further their studies, and continue whilst they had “study momentum”, to the next level. Whilst some respond positively, there are others who just wish to obtain their degrees and finish their studies after a prolonged period of self-sacrifice, and absence from their families, hobbies or other domestic arrangements. I fully appreciate this and would never coerce anyone into several more years of study unless they genuinely wanted to take this leap. When working in England I have generally been delighted when a good and enthusiastic student expresses a desire to register for PhD. It is particularly heartening when they wish to do so because of the experiences they have had working on a course in which I have played a small part. There is no denying that I always feel an immense sense of pride when a few years later they walk onto a stage to receive their doctorates. However, when we started the MA in special and inclusive education programme in Bangalore, I had not really anticipated the level of interest that we might have here for doctoral level study. I can honestly report that the quality of work we have received from students in our Bangalore cohorts has been very high. Their independence as researchers and their commitment to study has been exemplary. They respond positively to criticism and advice, and they have been a joy to teach. 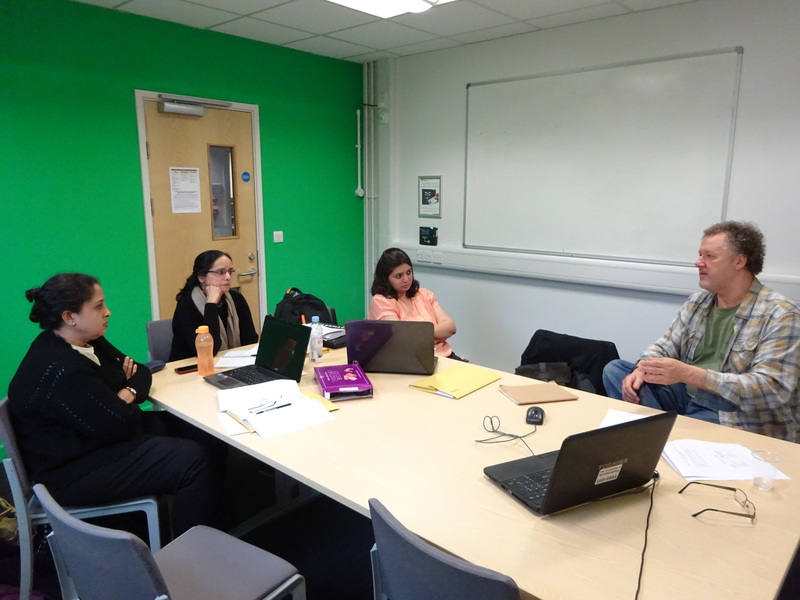 As our first cohort commenced work on research for their final dissertations some of them began to discuss amongst themselves the possibility of furthering their studies. This initial murmur eventually got louder until a few actually made the plunge to ask about continuing their development as researchers. What motivates them to take this bold step to an even higher level of study I wonder? We are always honest with students about the significant endeavour that will be involved. In conversation with those who have now made a commitment and made applications for doctoral level study, it is evident that it is not the prospect of an academic career that has focused the minds of most, but rather a genuine desire to investigate aspects of their work, and the children and families they support. In so doing they hope to gain greater understanding of how the lives of others might be improved, and the ways in which the education services provided here in India can become more inclusive. Having seen the level of motivation that characterises our Indian students, I find the prospect of working with some of them, as they hone their research skills and conduct empirical studies into aspects of inclusion, both exciting and daunting. Exciting because I know of their commitment and enthusiasm, and believe that they will produce studies of outstanding quality. Daunting because I know that I will need to be on my mettle to keep up with these consummate professionals, as they gain further in their confidence as researchers and thinkers. 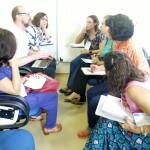 Dr Marli Vizim (in the pink top) sharing her views on poverty and school exclusion with colleagues from Brazil and the UK. Whilst working last week with colleagues from both the UK and Brazil I often found myself thinking that whilst we work in very different countries and have contrasting cultural backgrounds, there is much that we have in common with respect to the educational issues that we face. Everyone in attendance at this research focused event was committed to promoting more inclusive education and the establishment of social justice, and we all face similar challenges in achieving our objectives. Listening to the presentations given at this three day workshop and more especially during conversations with researchers from both countries, it was evident that the usual anxieties about inadequately prepared teaching staff, poor resourcing and low expectations of students as obstacles to inclusion, formed the basis of discussion. Similarly, the disparity between urban and rural educational opportunities and the impact of economic difficulties was apparent in many of the sessions we shared. At times I found myself reflecting on the fact that these are recurrent themes that I have heard not only in the UK and Brazil, but during recent visits to China, India, Georgia and Ireland. I have no doubt that similar frustrations would be raised in most of the world. Of all the issues of concern, one that certainly troubles me most was highlighted in an excellent paper given by Marli Vizim, who is committed to working with some of the poorest and most marginalised communities in São Paulo State. Clearly influenced by the work of the great Brazilian educator Paulo Friere, Marli describes how she has tried to work with whole communities, and in particular the leaders of these groups, in an effort to foster positive attitudes to schooling, and increased opportunities for children. In particular she has demonstrated the importance of gaining the support of community leaders in order to get children previously seen as ineducable into schools. The passion with which Marli speaks and her willingness to engage in discussion and debate was encouraging and heartening. The fervency that she feels for her work is something that cannot fail to touch anyone who has a social conscience and wishes to see the lives of children and their families improved. 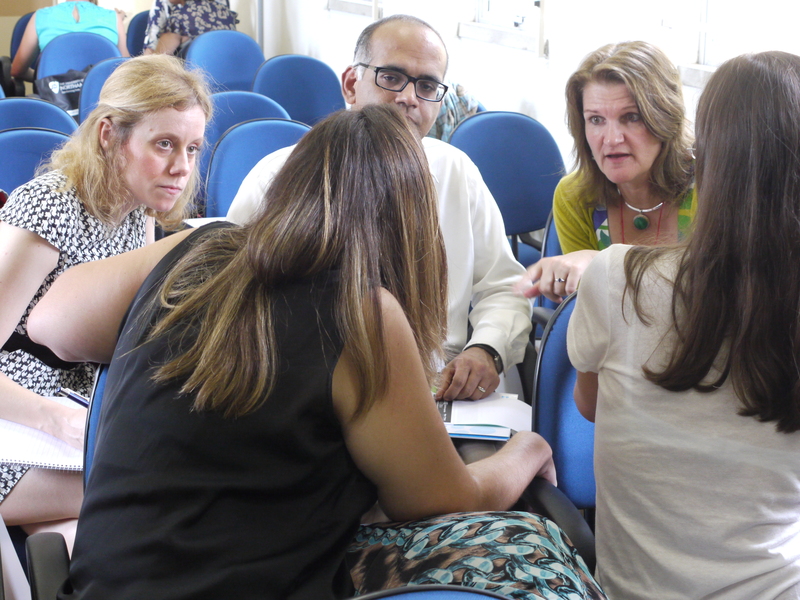 In a discussion group comprising colleagues from both Brazil and the UK it was easier to find similarities in our areas of concern than differences. As Marli indicated the increasing gulf that exists between the rich and the poor in Brazil, so did colleagues from the UK provide examples of a similar concern in our own country. Several of us were also able to relate this worrying trend to work we have done in other parts of the world. Whilst I have seen this increasing distance created between the wealthy and poor in India, other colleagues spoke eloquently about the same situation seen in Colombia and elsewhere in the world. Working through an interpreter always has the risk of ideas being confused during translation, but there was no doubting the level of concern and frustration with regards to current provision made for children from poorer sections of society being expressed in these sessions. The authors of the 2014 UNESCO Global Report on the Education for All Goals, discussed previously on this blog (Feb 4th 2014), were careful to emphasise the progress that has been made towards achieving universal primary education. However, it is clear from the report that one of the greatest obstacles to making effective progress is poverty. Whilst the poverty that we see in the UK is nowhere near as widespread and pervasive as that seen in many poorer countries, this does not justify a denial of the damaging impact that it has on families. Listening to Marli speaking about the continuous struggle that some of the families face in the areas where she works, emphasised the potential for social unrest that is ever present, and could worsen if the needs of the most disenfranchised members of society are not addressed. During my brief visit to Brazil it was apparent, just as it is here in the UK or when I work in Ireland or India, that there are many businesses and individuals that are thriving and creating considerable wealth. The economies of these countries have clearly benefited from the evident entrepreneurship and hard work of these individuals and their employees. However, just as the opportunities for the most educated and socially well connected people in these countries have increased, so have the difficulties faced by the poorest communities multiplied. Fortunately researchers such as Marli, who recognise that they have a responsibility beyond investigating the communities with which they are involved, are having an impact. The results from her research indicate that expectations are being raised and demands for improved educational opportunities made in the areas where she works. Slowly this action is bringing about change, and hopefully the lives of the families to whom she has made a commitment will improve. The responsible educational researcher is one who recognises, that unless their investigation focuses upon improvements in the educational opportunities for children, families and teachers, it is probably of limited value. As a watery light began to announce this morning’s dawn, I made my way along the straight road that leads towards the centre of São Carlos. 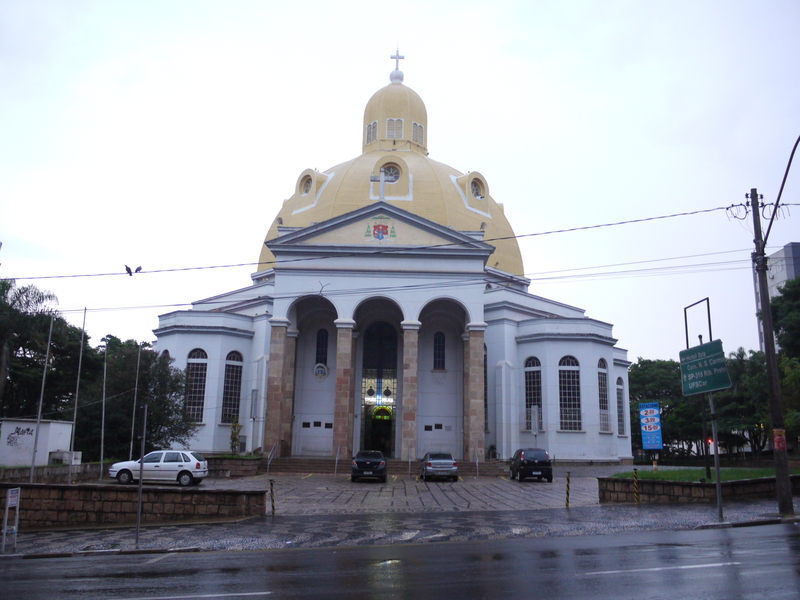 My destination was the Catedral de São Carlos Borromeu, with its canary yellow dome, said to have been modelled on that of St Peter’s in Rome, though of course on a much smaller scale. Despite leaden skies and a morning not yet fully formed, it would be impossible not to be impressed by the modern stained glass windows that are the most striking feature of this building. Beneath the dome a blue and yellow encirclement of abstract glass softens the rather austere white walls. But most surprising is the movement captured in larger windows that depict street scenes, with representations of men and women apparently walking across the glass. A further panel reveals a fisherman casting his hopeful nets all created in a vivid blue. In medieval days of course, the stained glass windows served an important function of displaying biblical stories to a largely illiterate congregation. These wonderful works of art would remind viewers of their duty, their Christian heritage and their mortality. The need for interpretation to those who had limited skills in reading, was clear at this time, and there are parallels with experiences at our workshop for early career researchers today. When researchers from two different countries and cultures come together there are always likely to be challenges, and amongst the greatest of these is that of language. Fortunately, just as in previous times the Christian masses had the assistance of stained glass, over the past three days we have had an excellent interpreter. Marcelos has demonstrated consummate professionalism in acting as a bridge between those colleagues whose only language is Portuguese, and others who have only English. His patience and good humour has enabled our work to flow freely and has ensured understanding and a sharing of ideas. The dissemination of knowledge is an essential part of the educational research process and today we had fine examples of how researchers have shared their investigations with different groups. David Preece placed an emphasis upon effective communication with the families of children on the autism spectrum, whilst Aila Narene Dahwache Criado Rocha demonstrated principles of communication between health workers and educators. 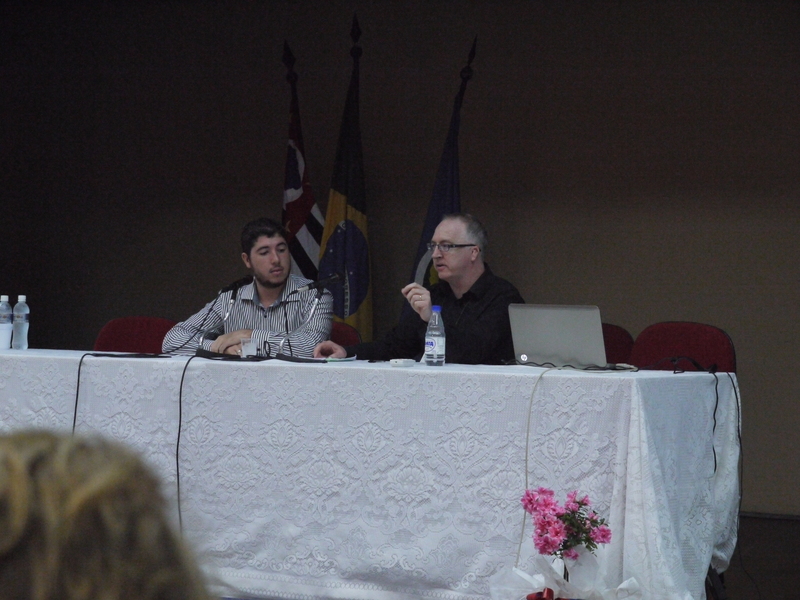 Niall Devlin fascinated the audience with his analysis of how educational psychologists relate to children, and Marli Vizim described the importance of respectful work with people living in some of the poorer communities of São Paolo State. Each of these presenters demonstrated an important feature of good educational research, that of ensuring that children teachers and families are not simply the subject of our investigations, but are accepted as partners at each stage of the process. This was a theme evident throughout the day, as participants in this workshop made ambitious plans for further work over the coming months and years. Although these researchers are at an early stage of their careers, it is already evident that they have a determination to conduct investigations that will be of benefit to others and move the inclusion agenda forward. 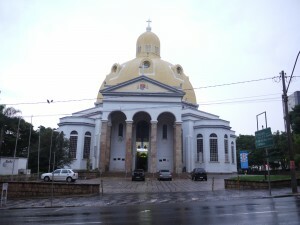 A coming together of colleagues in São Carlos has proven to be a great success. In the initial stages there was apparent nervousness, apprehension about the route ahead and the challenges of working in two languages. But just as the cathedral stained glass windows gradually increased the intensity of the light within the building this morning, so have the last few days seen an increase in confidence and an awakening of ideas. I am sure that several working relationships and a number of long term friendships will have been established during three days of working together in São Carlos. I am equally confident that educational research aimed at improving the lives of children and families is safe in the hands of these early career researchers with whom I have been privileged to work this week. Many thanks to all for your hard work and collaboration during this brief visit.